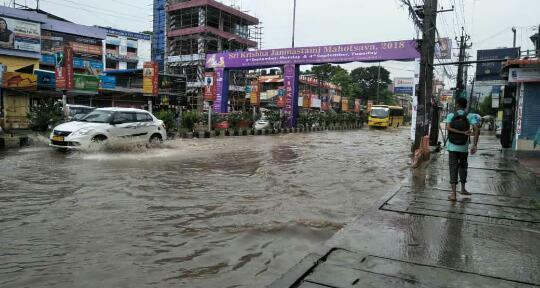 There seems to be no end to the deluge of monsoon rains for the denizens of Guwahati. Another smart shower for hardly an hour early Sunday morning inundated like always several areas of the gateway of the Northeast throwing life out of gear. Though it was a Sunday morning with offices, educational institutions and business establishments remaining closed, commuters taking to the streets for various odd jobs and students in particular going for tuition had a harrowing time with several areas flooded with knee-deep water. The most affected area was the Zoo Road Tiniali area where several coaching classes are located. Students had to wade through the flood waters risking their lives to attend their coaching classes which they cannot afford to miss out. Vehicles remained stranded due to water logging on the road and the road witnessed a major traffic snarl. “We are now going to tuition by taking such a grave risk to our lives. Because, there may be manhole on the footpath,” she added. Electricity was shut down in most places of the city immediately after the rain had started fearing more electrocution incidents.